Book has been our friend since long time ago and apparently, we are not just satisfied by reading…We can to sleep on them, sit on them, cook with them, grow plant out of them. You might wonder I am going crazy, aren’t you? Then stop wondering, just check today’s post, we have some really creative and unusual idea out of our normal book. Got some books piling up in the corner just collecting dust? Turn them into flower pots! 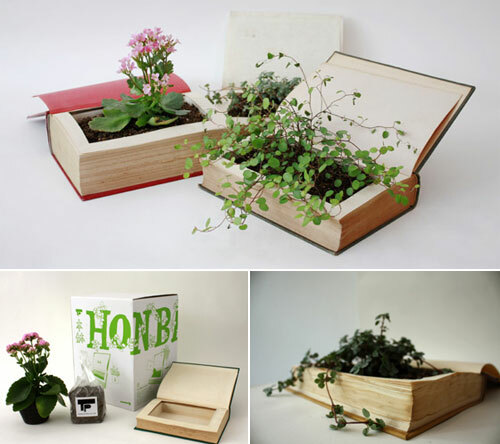 The honbachi, or book pot, was designed by graphic design agency Tokyo Pistol. I love how the moisture corrodes the pages and the book takes on a life of its own! From the idea that objects should adapt to people, and not the other way around, is born “take a seat”. This folder stool uses the existing storage space that everyone dispose. 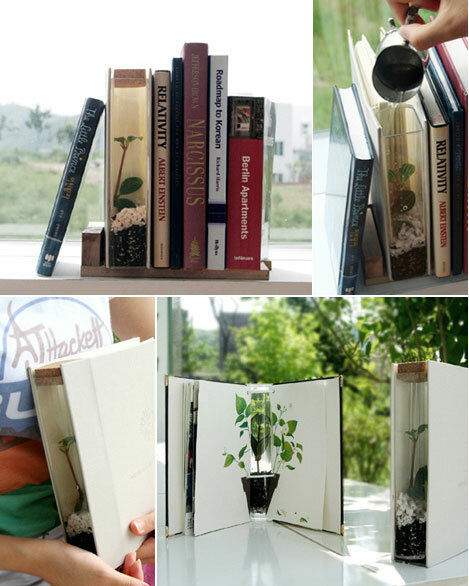 It hides in your interior by taking the form of a regular book on a shelf. When you open this book, the pages unfold and create an extra seat to share with your guests. Made from solid oak boards and steel hinges, “Take a seat” provides a steady and comfortable casual stool. 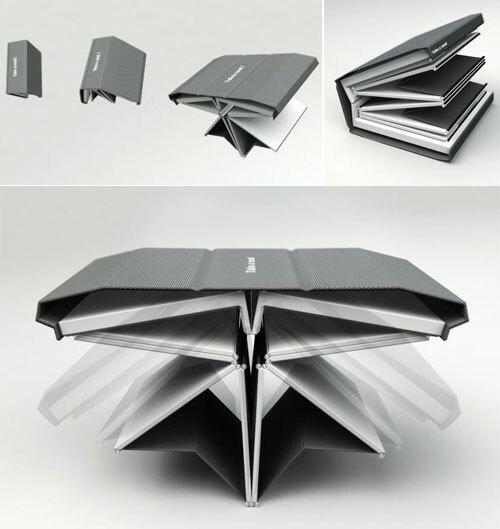 Paperbax: The Ultimate Book Holder– Leave it at home or pop it into your pocket, backpack or handbag. Clip it onto a book to mark your spot and protect pages while on the go. 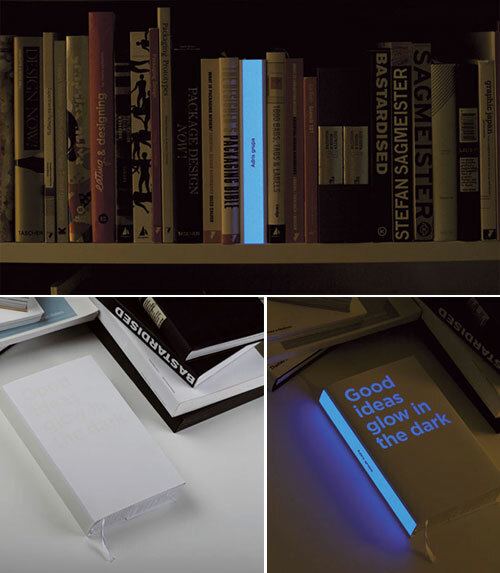 Paperbax is the perfect lightweight and compact literary accessory for readers of all ages. Use Paperbax while exercising, commuting, traveling, for hobbies, homework, typing, bathing, nursing, sunbathing, cooking and more. This wonderful book actually contains sheets that are embedded with spices. Traditionally we chop and store the flavorings in jars, but this is kinda like the soap-strip! Tear it and use it. Need some pepper? Just tear out the perforated page and add it to the dish! 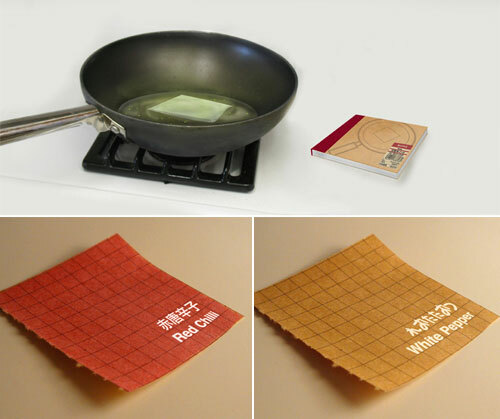 Edible quality paper embedded with the spice dissolve into the food, adding the much needed flavoring. The moisture and heat ensure that the spices mix in well. Despite the crisis, Adris Group has had a successful business year-2008, so they wanted to show it off with their annual report. During difficult times, only good ideas can light up the path out of the crisis. Ideas are energy! They emerge in a moment and spread at the speed of thoughts and people channel them. Ideas are passed on from person to person until their radiance becomes powerful enough to light up the future. Isn’t this neat? we think so, and we love this unique concept. you’ll really surprise everyone with this beautiful and semmingly innocent book. 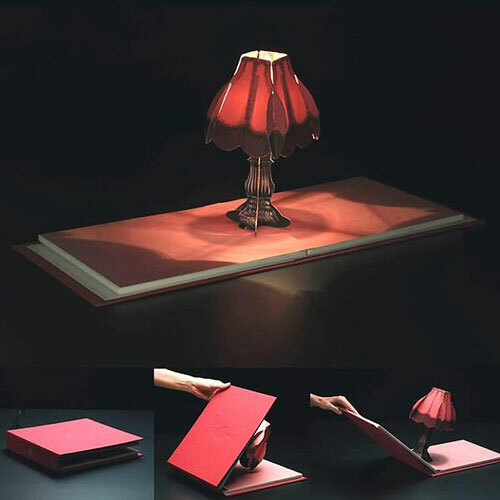 the book of light’s protagonist pops up when you open its hardy white pages, revealing a wonderfully crafted and cleverly folded lamp powered by a simple low voltage adapter. finally a coffee table book that you’ll actually open. 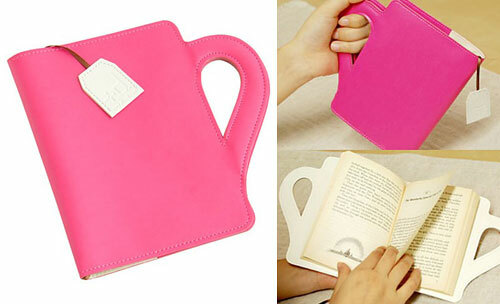 Carry your books in style and with a sense of humor with this pretty protective book cover that’s shaped like a teacup. You can carry them in your handbag, backpack or suitcase knowing they’re well protected. The book cover is neon pink and it’s made out of imitation leather. It comes with a page marker, sewn inside the “cup”, that imitates the string on a teabag. There are two folds inside for you to insert the book’s front and back covers so it’ll fit snuggly and won’t move or slip out of the book cover. 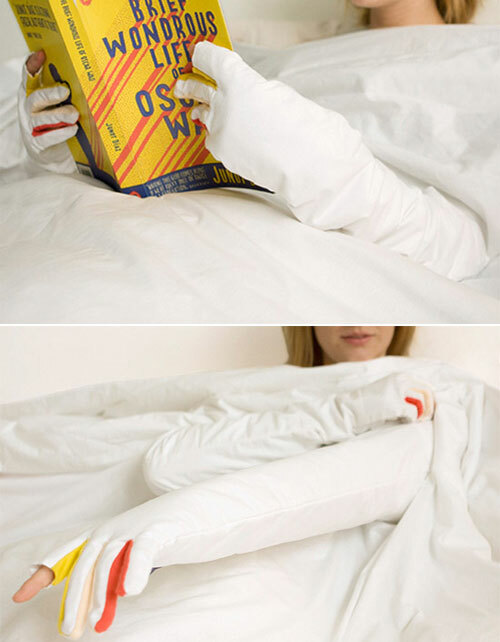 Everyone reading in bed knows the feeling of cold arms. Spanish fashion designer andrea ayala closa came up with an idea to solve this: a ‘sleeve blanket’ to keep the arms warm. It features an opening for the index finger to allow readers to turn pages conveniently. We all know real workaholics never rest, and now their secret is out: the Workaholic Pillow! 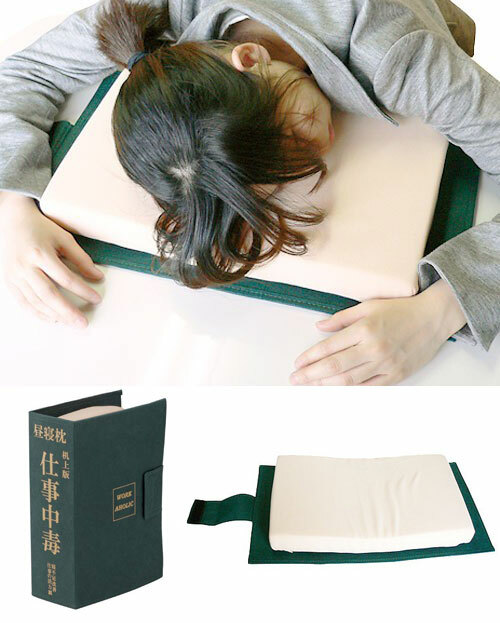 Workaholic Pillow is a cushion hiding in book shell.